ART AND MAGIC. Exhibition in Rovigio, Italy – Zero Equals Two! Palazzo Roverella in Rovigo, Italy will host the ART AND MAGIC. ESOTERICISM IN EUROPEAN PAINTING FROM SYMBOLISM TO HISTORICAL AVANT-GARDES exhibition from September 29 to January 27. 2019. “Promoted by the Cassa di Risparmio Foundation in Padua and Rovigo with the Accordi dei Concordi and the Municipality of Rovigo Francesco Parisi, the exhibition traces the relationships between the esoteric currents in vogue between 1880 and the years immediately following the First World War and their influence on the European figurative arts, from the symbolist movement to the subsequent historical avant-gardes. “Among the artists on show: Odilon Redon, Paul Ranson, Eugene Grasset, Jean Delville, Felicien Rops, Austin Osman Spare, Paul Serusier, Alberto Martini, Carlos Schwabe, Wassily Kandinsky, Auguste Rodin, Edvard Munch, Frantisek Kupka, Giorgio Kienerk, Leonardo Bistolfi, Ferdinand Hodler, Albert Trachsel, Mikalojus Constantitnas Ciurlionis, Hugo Höppener (Fidus), Peter Behrens, Bruno Taut, Ernesto Basile, Paul Klee, Johannes Itten, Luigi Russolo, Willelm Morgner, Kazimir Malevich, Gaetano Previati, George Frederic Watts, Giacomo Balla, Piet Mondrian, Frantisek Kupka, Romulus Romans. “The focus on esoteric doctrines, with their wealth of figurations and myths, explodes in late nineteenth-century Europe, coinciding with the development of symbolist art. Starting from France and Belgium, the influence of esoteric culture on the figurative arts soon spread to Europe, intertwining with literature and involving, thanks to Josephin Peladan and his Salon de la Rose + Croix, the main protagonists of international symbolism , from Arnold Böcklin to Gaetano Previati. “The hermetic theories, and mainly the Theosophy of Helena Petrovna Blavatsky, finally had an important role, together with research on optics and colors, in the genesis of abstraction, especially within the Bauhaus movement, influencing the work of artists such as Paul Klee, Johannes Itten, Piet Mondrian and Wassily Kandinsky. 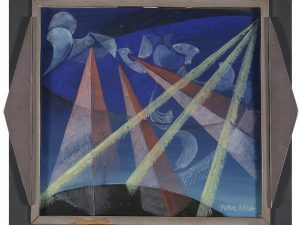 In Italy the link with the esoteric symbologies will also influence the research on the abstractionism of painters such as Giacomo Balla, Arnaldo Ginna and Julius Evola in a singular parallel with the interests for the esoteric doctrines of writers such as Gabriele D’Annunzio, Dino Campana and Luigi Pirandello . “Encouraged by literary texts such as the great initiates of Edouard Schuré or the famous decadent novel La-Bas by Joris Karl Huysmans, painters and sculptors, but also travelers, writers and journalists, found in oriental religions or in hermetic texts a sort of alternative fashion to reflections on Christianity. During the ‘900 then they came to create real communities, like that of Monte Verità (near Ascona), developed around a magical / irrational utopian system in which the followers practiced solar cults, nudism and vegetarianism and in which among them were Carl Gustav Jung, Hermann Hesse and Paul Klee. “Until the second half of the nineteenth century the interest of artists for esotericism followed a karst path emerging in the figurative arts in the romantic period following the interest for the gothic and theories of the sublime. “As evidence of how much the artists’ interest in esotericism has followed a constant trend, each of the eight sections in which the exhibition develops is introduced by a historical work (from the Renaissance to the Enlightenment). “In the exhibition, the viewer will be involved in a real initiatory path that will proceed from the invitation to silence (section I, Entry, Enigma, Invitation to Silence), through temples and ares (section II, esoteric architecture: temples and the altars) towards the initiatory illumination, thus ending with the representation of auras and rays (section III, Psyche, Cosmo, Aura and ancestral forms). “Among the protagonists of the exhibition in accurate iconographic sections, the Devil in all its mutations: from demons intent on sowing tares among men, up to the modern Faust that accompanies the artist in the creative act. The witch, already an icon of decadent Liberty, now leads the artist into the abyss of voluptuousness and submission as in the famous painting by Gustav Adolf Mossa Elle. Night animals, owls, wolves, crows, bats, mysterious and fascinating. Finally, a gallery of portraits of artists, philosophers and thinkers, exponents of Western and Eastern esoteric theories. “A large section is also dedicated to illustrated books and engravings, to accompany the entire journey, from the Malleus Maleficarum, Renaissance incunabulum, up to the editions of three 800 and 900. So make your travel plans now!